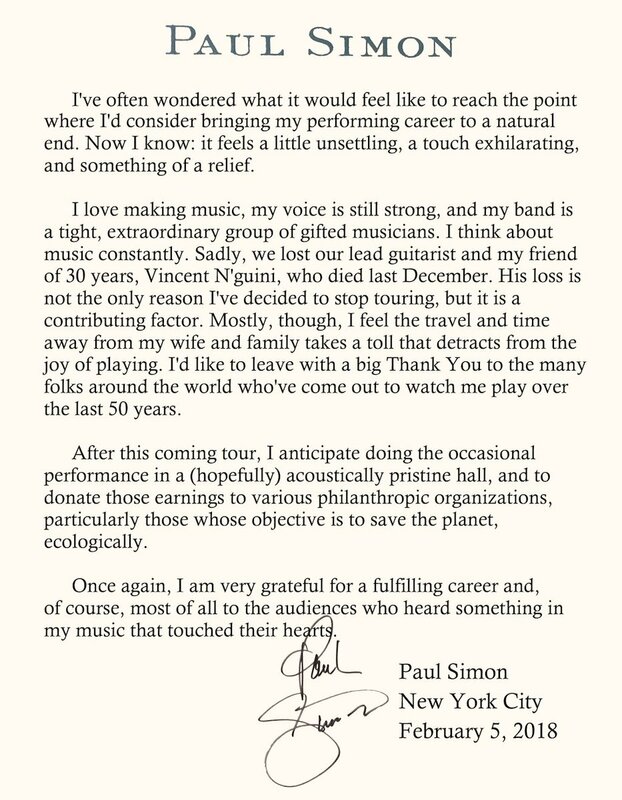 Paul Simon has revealed that he will retire from live performance this year following a series of shows in the US and Europe. In a statement posted on Twitter, Simon described his retirement as a “natural end” to his performing career that felt “something of a relief”, citing the strain of time away from his wife and family as the reason behind his decision. He also mentioned his lead guitarist Vincent Nguini, noting that his death in December was a “contributing factor”. Simon said that he expected to do the “occasional performance” for charity following the tour’s conclusion. Paul Simon’s career in music began over 60 years ago, when he formed a duo with school friend Art Garfunkel named Tom and Jerry. After briefly parting ways, the pair reunited in 1963, and soon found fame with their single The Sound of Silence. The pair went on to become one of the most successful acts of the decade, thanks to hits such as Bridge Over Troubled Water and Mrs Robinson. The farewell tour is named after another early Simon and Garfunkel song, which was written by Simon during his time living in the UK prior to the pair’s huge success. Simon and Garfunkel split for good in 1970, and Simon – who had written almost all of the pair’s material – embarked on a solo career. He would go on to produce a number of hugely successful albums, including 1975’s Still Crazy After All These Years and, a decade later, Graceland, which was groundbreaking in its fusion of folk with African music influences. During his career, Simon released 13 solo albums, won 16 Grammys and sold more than 100m records. Last edited by bill barilko; Feb 6th, 2018 at 11:49 PM.. Pretty amazing song writer. He's certainly up there with the greatest ones. Canadian skier Grandi calling it quits?